Tamison's ancestry can be seen at her father Ebenezer Howe's page. Azubah's ancestry can be seen at her father Jonas Richardson's page. She first married Benjamin Pierce. Descendancy of Joel Brooks, including sons Joel and Silas. 1. 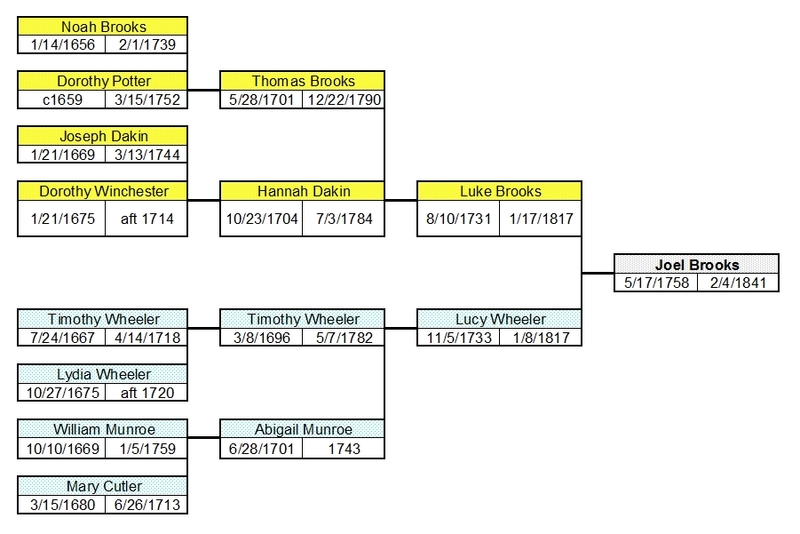 JOEL6 BROOKS (LUKE5, THOMAS4, NOAH3, JOSHUA2, THOMAS1) was born 17 May 1758 in Stow MA, and died 04 Feb 1841 in Gardner MA. He married (1) TAMISON HOWE 10 Mar 1791 in Winchendon MA [int 11/14/1790 Gardner MA], daughter of EBENEZER HOWE and ELIZABETH DELAND. She was born 31 Aug 1770 in Gardner MA, and died 13 Jan 1806 in Gardner MA. He married (2) AZUBAH RICHARDSON 06 Nov 1806 in Gardner MA, daughter of JONAS RICHARDSON and MARY BAILEY. She was born 05 Sep 1772 in Shrewsbury MA, and died 19 Mar 1841 in Gardner MA. 2. iii. BETSEY BROOKS, b. 22 Jun 1796, Gardner MA; d. 18 Jun 1824, Gardner MA. 3. iv. JOEL BROOKS, b. 05 Apr 1798, Gardner MA; d. 13 Feb 1877, Gardner MA. 4. v. SILAS BROOKS, b. 08 Jul 1800, Gardner MA; d. 06 Apr 1846, Gardner MA. viii. CHRISTIANA7 BROOKS, b. Abt. 1810; d. 16 Jul 1838.
ix. LOIS BURGESS BROOKS, b. Abt. 1810, Gardner MA. x. AZUBAH PIERCE BROOKS, b. Abt. 06 Nov 1814, Gardner MA. 2. BETSEY7 BROOKS (JOEL6, LUKE5, THOMAS4, NOAH3, JOSHUA2, THOMAS1) was born 22 Jun 1796 in Gardner MA, and died 18 Jun 1824 in Gardner MA. She married ISAAC JACKSON 04 Oct 1818 in Gardner MA, son of OLIVER JACKSON and MARY PIERCE. He was born 24 Nov 1792 in Westminster MA, and died 29 Oct 1844 in Gardner MA. 5. i. SUSAN ELVIRA8 JACKSON, b. 07 Aug 1820, Gardner MA; d. 06 Jan 1876, Gardner MA. 6. ii. BETSY TAMESON JACKSON, b. 22 Aug 1822, Gardner MA; d. 03 Jan 1847, Fitchburg MA. 3. JOEL7 BROOKS (JOEL6, LUKE5, THOMAS4, NOAH3, JOSHUA2, THOMAS1) was born 05 Apr 1798 in Gardner MA, and died 13 Feb 1877 in Gardner MA. He married CYNTHIA TAYLOR 19 Mar 1824 in int Gardner MA, daughter of ISAAC TAYLOR and BETSEY WHITNEY. She was born 17 Feb 1802 in Winchendon MA, and died 01 Sep 1880 in Gardner MA. 7. i. BETSEY8 BROOKS, b. 15 Apr 1825, Gardner MA; d. 07 Dec 1911, Gardner MA. 4. SILAS7 BROOKS (JOEL6, LUKE5, THOMAS4, NOAH3, JOSHUA2, THOMAS1) was born 08 Jul 1800 in Gardner MA, and died 06 Apr 1846 in Gardner MA. He married EMILY CONANT 27 May 1824 in Gardner MA, daughter of JOSIAH CONANT and ANNIS DERBY. She was born 19 Aug 1801 in Gardner MA, and died Apr 1882 in Fitchburg MA. 8. ii. SYLVANUS BROOKS, b. 18 Feb 1828, Gardner MA; d. 14 May 1901, Fitchburg MA. 9. iv. GEORGE BROOKS, b. 04 May 1835, Gardner MA; d. Bet. 1870 - 1900. 10. vii. WEBSTER BROOKS, b. 08 Dec 1841, Gardner MA; d. Bet. 1900 - 1910. 5. SUSAN ELVIRA8 JACKSON (BETSEY7 BROOKS, JOEL6, LUKE5, THOMAS4, NOAH3, JOSHUA2, THOMAS1) was born 07 Aug 1820 in Gardner MA, and died 06 Jan 1876 in Gardner MA. She married SYLVESTER K PIERCE 11 Jun 1845 in Gardner MA, son of JONAS PIERCE and ACHSAH HAYNES. He was born 11 Apr 1820 in Westminster MA, and died 28 Jan 1888 in Gardner MA. 11. i. FRANK JACKSON9 PIERCE, b. 13 Jun 1856, Gardner MA; d. Aft. 1940. 6. BETSY TAMESON8 JACKSON (BETSEY7 BROOKS, JOEL6, LUKE5, THOMAS4, NOAH3, JOSHUA2, THOMAS1) was born 22 Aug 1822 in Gardner MA, and died 03 Jan 1847 in Fitchburg MA. She married ALONZO DAVIS 21 May 1845 in Gardner MA, son of GEORGE DAVIS and ANNE PERLEY. He was born 15 Nov 1817 in Gardner MA, and died 23 May 1888 in Fitchburg MA. 12. i. WALTER ALONZO9 DAVIS, b. 13 Jul 1846, Fitchburg MA; d. Aft. 1920. 7. BETSEY8 BROOKS (JOEL7, JOEL6, LUKE5, THOMAS4, NOAH3, JOSHUA2, THOMAS1) was born 15 Apr 1825 in Gardner MA, and died 07 Dec 1911 in Gardner MA. She married LUMAN HYDE HENDRICK 14 Jan 1855 in Gardner MA, son of STILLMAN HENDRICK and ABIGAIL HAVENS. He was born Abt. 1825 in VT, and died 01 Mar 1904 in Gardner MA. 8. SYLVANUS8 BROOKS (SILAS7, JOEL6, LUKE5, THOMAS4, NOAH3, JOSHUA2, THOMAS1) was born 18 Feb 1828 in Gardner MA, and died 14 May 1901 in Fitchburg MA. He married CHARLOTTE L WHEELER 28 Sep 1854 in Templeton MA, daughter of ASA WHEELER and MARY GRAY. She was born 15 Feb 1829 in Westminster MA, and died Aft. 1880. 9. GEORGE8 BROOKS (SILAS7, JOEL6, LUKE5, THOMAS4, NOAH3, JOSHUA2, THOMAS1) was born 04 May 1835 in Gardner MA, and died Bet. 1870 - 1900. He married HARRIET RAY 29 Mar 1852 in Gardner MA, daughter of ALMON RAY and OLIVE KEMP. She was born Dec 1834 in Westminster MA, and died 14 Jul 1903 in Gardner MA. 13. ii. IDA MARIA BROOKS, b. 02 Jul 1862, Gardner MA; d. Aft. 1930. 10. WEBSTER8 BROOKS (SILAS7, JOEL6, LUKE5, THOMAS4, NOAH3, JOSHUA2, THOMAS1) was born 08 Dec 1841 in Gardner MA, and died Bet. 1900 - 1910. He married MARY E PRATT 10 May 1870 in Natick/Ashland MA. She was born Jun 1848 in MA, and died Aft. 1920. 11. FRANK JACKSON9 PIERCE (SUSAN ELVIRA8 JACKSON, BETSEY7 BROOKS, JOEL6, LUKE5, THOMAS4, NOAH3, JOSHUA2, THOMAS1) was born 13 Jun 1856 in Gardner MA, and died Aft. 1940. He married CORA S KNAPP 01 Jan 1884 in Gardner MA, daughter of JAMES KNAPP and FRANCES C. She was born Abt. 1866 in MN, and died Aft. 1940. 12. WALTER ALONZO9 DAVIS (BETSY TAMESON8 JACKSON, BETSEY7 BROOKS, JOEL6, LUKE5, THOMAS4, NOAH3, JOSHUA2, THOMAS1) was born 13 Jul 1846 in Fitchburg MA, and died Aft. 1920. He married FANNIE ADELIA BOGART 28 Apr 1874 in Fitchburg MA, daughter of CORNELIUS BOGART and SARAH LOVELL. She was born Feb 1849 in West Fitchburg MA, and died 31 May 1907 in Fitchburg MA. 13. IDA MARIA9 BROOKS (GEORGE8, SILAS7, JOEL6, LUKE5, THOMAS4, NOAH3, JOSHUA2, THOMAS1) was born 02 Jul 1862 in Gardner MA, and died Aft. 1930. She married FRANK LEVI HINDS 17 Jan 1891 in Gardner/Athol MA, son of ABIJAH HINDS and HARRIET WARD. He was born 13 Sep 1867 in Gardner MA, and died Aft. 1930. 14. ii. FRANK NELSON HINDS, b. 04 Apr 1892, Gardner MA; d. 31 Oct 1983, Northampton MA. 15. iii. GAILON ALBERT HINDS, b. 25 Sep 1897, Northampton MA; d. Aft. 1940. 16. iv. ADRIAN CHARLES HINDS, b. 25 Dec 1900, Northampton MA; d. 06 Nov 1988, Great Barrington MA. 14. FRANK NELSON10 HINDS (IDA MARIA9 BROOKS, GEORGE8, SILAS7, JOEL6, LUKE5, THOMAS4, NOAH3, JOSHUA2, THOMAS1) was born 04 Apr 1892 in Gardner MA, and died 31 Oct 1983 in Northampton MA. He married WINIFRED C ?. She was born Abt. 1895 in MA, and died Aft. 1940. 15. GAILON ALBERT10 HINDS (IDA MARIA9 BROOKS, GEORGE8, SILAS7, JOEL6, LUKE5, THOMAS4, NOAH3, JOSHUA2, THOMAS1) was born 25 Sep 1897 in Northampton MA, and died Aft. 1940. He married RUTH ?. She was born Abt. 1901 in MA, and died Aft. 1940. 16. ADRIAN CHARLES10 HINDS (IDA MARIA9 BROOKS, GEORGE8, SILAS7, JOEL6, LUKE5, THOMAS4, NOAH3, JOSHUA2, THOMAS1) was born 25 Dec 1900 in Northampton MA, and died 06 Nov 1988 in Great Barrington MA. He married HAZEL LAMBERT. She was born Abt. 1902 in MA, and died Aft. 1940.